This incredible bespoke kitchen splashback is a very recent work of ours that found itself at home behind a cooker in Maidenhead, Kent. It’s a beautiful variation on our Tree of Life, of course, and it’s a particularly vibrant example. 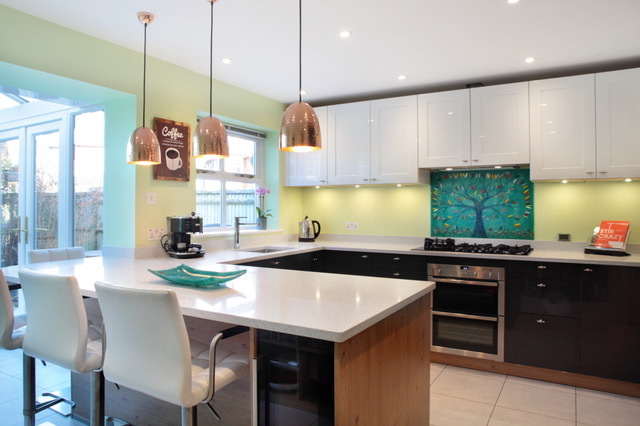 The piece definitely puts the life into the kitchen, with a flourishing tree spreading its leaves across the splashback and fully utilising the space given to it. To complete the effect, there’s a row of gorgeous flowers in full bloom lining the bottom of the piece, as well as a pair of butterflies making their way upwards. When you take a step back and look at the end result, it looks positively teeming with life! The bright colours of the piece work especially well because of the clean, modern décor surrounding it. As you should be able to tell from the images above, there’s not a lot of colour in the kitchen otherwise, and the room is very sleek and neutral overall. We really loved it before, but we think that the addition of a fused glass centrepiece took everything to that next level! Needless to say, we were very happy with the result, and so was the customer. We can’t really ask for more than that! If you’d absolutely love to put something like in your own home, make sure you get in touch with The House of Ugly Fish as soon as you can! We’re more than ready to create a gorgeously bespoke kitchen splashback for you, featuring a personalised design that’s a perfect for your home, but you choose from any of the many products that we make. What’s more, getting in contact is as easy as making an online enquiry via email or simply picking up the phone to give us a call. Come and share all your ideas for the perfect piece of glass!